This book provides clear guidance as to which neuroradiological findings in ill or injured patients should be immediately communicated by radiologists and trainees to the emergency room and referring physicians in order to facilitate key decisions and eliminate preventable errors. It offers a practical and illustrative approach that identifies what to look for and how to report it and describes the required follow-up and the most common differential diagnoses of the main critical findings in neuroradiology. 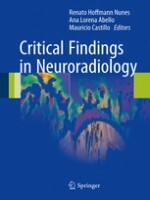 The book is distinctive in being written from a “critical findings perspective”, which makes its content more practical and memorable than that of a standard Emergency Neuroradiology textbook. It also illustrates the value of developing algorithmic approaches to report and communicate critical findings based on lists. While the book will appeal to a broad and variable audience, it is especially addressed to radiology training programs and will be a “must read” for residents and fellows in training.